When it comes to a clean kill, it doesn’t just take a skilled archer; it takes the right broadhead. It doesn’t matter if you have good or bad form as a shooter, the need for a quality head is crucial to have an advantage on your game. Here at Full Draw Archery, we sell three different types of broadheads. If you are new to archery, then you may not know the difference and that’s okay. We are here to help you understand the pros and cons of each so that you can confidently purchase the right broadhead. An old yet simple design, fixed blade broadheads are the perfect head if you are eyeing thick-skinned game, such as large whitetails, bears and elk, because of its great penetration thanks to the cut-on-contact tip. The only problem with these is that you will have to take the time to re-sharpen them when they begin to get dull. With some fast-shooting bows, their flight may not be the best quality. Generally used by beginners, replacement blade broadheads generally have great flight and can simply be replaced when they get dull. Flight characteristics and the ability to penetrate have drastically improved over the years with new tip designs. The problem? They are usually less durable, more expensive and don’t have as much penetration depth as fixed blades. Also known as expandable broadheads, mechanical broadheads are the most ideal choice if you have a finicky bow thanks to their advanced flight traits. When you have a thin-skinned game standing broadside, these broadheads make for excellent penetration. However, if there are deflections, penetration and performance quality can suffer. 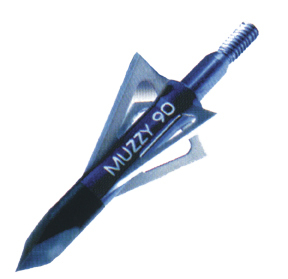 With this type of broadhead, it is vital that the shooter be precise in their shooting. If you are still confused on the type of broadhead that you need, just shoot us an email or give us a call to speak to one of our experts. We are happy to help you find the right type of broadhead so that you can get the game that you deserve.